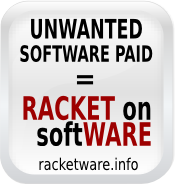 Racketware.info > en > Act now! This page is also available in: EN ES FR. Request (politely) that the computer manufacturers and resellers be forced to offer the consumer the choice to accept or decline the bundled software. Use our Guide (French version here) to take the correct steps (don't forget to have an insurance so that you can afford going to court with a lawyer). Parse our list of contacts worldwide to seek experienced people in your country. Choose a lawyer specialized in computer issues in your country, and go to court! If you live in the European Union, the same legal arguments apply. They have been furbished in France through more than 30 decisions.